SFD: Hi guys, it's a pleasure to have you with us. LARRY: Thanks, SFD. It's only fitting for us to interview with Street Fighter Devotion! "Devotion" doesn't begin to cover us. Of course, Shael dreamt up OC ReMix's Blood on the Asphalt album honoring the Super Turbo soundtrack, which is how we ended up here today. And way back, Dave's mom let him cut school so he could play Street Fighter Alpha the day it was released for the PlayStation. Personally, I've been a fan of Street Fighter since The World Warrior came out in the arcades, and Street Fighter's been my favorite game series since then. From World Warrior to Alpha to 3rd Strike, even to MvC 2 and CvS 1 & 2, for me it's literally the franchise that turned video game music from a casual interest into an occupation. So, to be where we are today with OverClocked ReMix working on the HD Remix soundtrack, it's extremely gratifying. It's a huge legacy. SFD: Can you tell us a bit about your involvement with OverClocked ReMix and the album Blood on the Asphalt? SHAEL: OverClocked ReMix, in little increments over the course of several years, gave me the resources I needed to develop a foundation as an electronic songwriter. I was super-big into it, checking the site every week for updates from 2000 to 2002, and then multiple times a day once the forum was implemented in 2002, until mid-2006. It's an extraordinary phenomenon, this musical community that developed essentially in a void, and devised its own rigorous, complex set of standards and practices, largely without being informed by the music industry or other music scenes. In the beginning, it had unprecedented accessibility, egalitarianism, and meritoriousness for a music scene; it was this groundbreaking social construction that brought people together who had an idea I'd thought was unique to myself for years: video game music, written for old sound chips, would sound awesome if re-created with new technology. And it brought them together not just to share their musical arrangements, but to critique one another's. When the forums were implemented, it suddenly became this place to learn and share musical techniques that had probably been devised in isolation, since most remixers had little access to other electronic musicians in meatspace, and weren't part of other musical communities, at least not back in the day. Anyway, I was big into listening and critiquing and trying to learn to do it better for a long time; I was big into the OverClocked community. I still check the site regularly, though I'm more interested in writing vocal pop music right now. 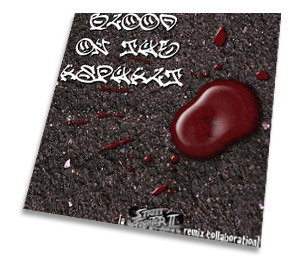 As far as Blood on the Asphalt goes, that was a tribute album I directed during 2005 and 2006. I proposed that a bunch of arrangers get together to cover every track on the Super Street Fighter II Turbo soundtrack. We got about twenty artists involved; I assigned one or more tracks to each one, and worked with them to ensure as much consistency in production value as possible. I also tried to keep all of the songs consistent thematically; they were supposed to evoke urban environments and enough emotional tension to be something you could play the actual game to. I think we were mostly successful in evoking that tone with the original Blood on the Asphalt, but the revisions we made for HD Remix improve on that success considerably. For the record, I didn't come up with the idea of OverClocked ReMix tribute albums; the tribute album format popped up in 2003 and has been utilized a dozen times since then. Every time, it's a big deal for the community. SFD: How did the collaboration begin with Capcom to use these tunes for the new Super Street Fighter II Turbo HD Remix game? SHAEL: So, Blood on the Asphalt was released in 2006, and then in 2007 I got an email from Rey Jimenez, an associate producer at Capcom, with �Blood on the Asphalt� in the subject field. He started the email with "Don't worry. This isn't a cease and desist," and went on to explain that Capcom enjoyed the album, and had been playing it in their booths at trade shows. Working under the assumption that Malcos (Stephen Malcom-Howell), who helped me direct the album, and I had done all of the music ourselves, Rey asked if we'd be willing to let them use it in HD Remix, and if we'd be willing to make some modifications in instances where they thought a track needed to be changed. I explained that I'd be happy to let them use to tracks I'd personally done, but that those tracks comprised only a small portion of the album, and that I'd need to get in touch the other 20-or-so people involved to get their permission. Problematically, though, I wasn't supposed to make knowledge of my and their potential involvement in the project public. That's when I emailed Dave; if anyone could get OC ReMixers to modify their tracks or supply their old project data without even so much as an explanation, it was him. Additionally, I felt OC ReMix was due to be credited as an entity; I directed Blood on the Asphalt, but its ownership lay with the community, and if OCR was going to be officially involved, Dave's oversight would be required. DJP: Shael "did the right thing" and emailed me so we could involve the OC ReMix community. Initially, I actually thought the whole thing might be a prank or something, so we agreed to conference call Rey and see if we could find out more. I remember finding out about the whole thing at work in Washington, D.C. I work in a building with crappy reception, so I went upstairs, through two sets of metal detectors and armed guards, and out onto the street, just for better reception. It was immediately clear talking with Rey that this was the real deal, and we agreed on a course of action that involved my acting as a gateway for Capcom's communication/feedback for artists, with Shael, Stephen, and Larry directly involved in coordination and planning. It was really hard to go back to work after that phone call and sit down and continue as if nothing had changed... I got started with sending emails the same night as soon as I got home, and we got the ball rolling. SFD: Were there any new tracks made specifically for Super Street Fighter II Turbo HD Remix? SHAEL: There were a number of instances in which Capcom asked us to ditch a track from Blood on the Asphalt and start from scratch, and a few instances in which a track needed for the game wasn't represented in Blood on the Asphalt at all, so yes. We ended up doing entirely new tracks for all of the endings and menu themes, and new stage music for Akuma, Guile, Blanka, Chun-Li, Ryu, E. Honda and Zangief. 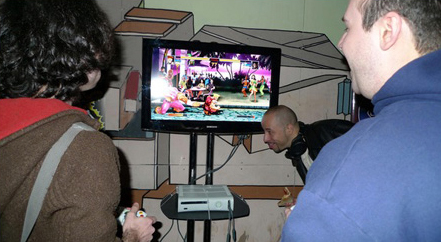 I actually did the new Zangief's stage theme myself, with my band The Grammar Club. That was a lot of fun. DJP: We presented not only Asphalt, but all the other non-Asphalt mixes on OCR, to Capcom, and while that covered most of what they wanted, there were some exceptions as Shael mentioned. It wasn't necessarily because we didn't already have some great stuff, mind you - I personally love the Asphalt version of Blanka, in particular - but in some cases Capcom wanted new material simply because they had a different idea about what would work in-game vs. as a standalone arrangement. SFD: What was it like working with Capcom? DJP: Pretty rad - Rey was very good about communicating their feedback, and we actually used Google Docs to track the project progress. If there was one downside, it's that we didn't get any sort of exclusive beta access or anything like that, so artists didn't really know what their tracks would sound like in-game - we had to rely on Capcom to tell us. But now that the game's out, and I can hear everything in context, I think they made a number of really good calls; everything sits just right and flows pretty smooth. In some cases their feedback was specific - turn the volume down on a specific instrument, speed the tempo up a bit, etc., but in other instances it was more challenging to interpret what they were asking for. We erred on the side of presenting multiple options, so they could just pick the option they liked best, which was an effective approach. This game had a pretty long development cycle, so there weren't too many "crunch time" moments when we had to scramble to meet a deadline. Overall, if I had to pick a single adjective to describe the process, I'd say it was smooth - they knew what they wanted, we worked with them to deliver it, there wasn't any drama, and I think the end result does the community proud. SHAEL: Dave's outlined the process very well. Unlike him, though, I did get to play the beta, in a limited capacity. 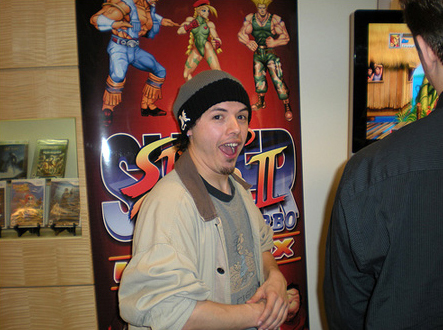 Since I live in Brooklyn, I was invited by Capcom to attend the HD Remix/Street Fighter IV premiere event in New York City with Jos� the Bronx Rican (Jos� E. Felix), who did Vega and Dee Jay's stage themes and most of the ending music. So, in early October, I got my hands on an almost-finished build. Jos� brought noise-canceling headphones to check out the music in-game--should have thought of that myself!--and was good enough to let me take a listen. So we were the weirdos at the party, with our headphones plugged into the TVs, checking out each piece of music's fit in the game. Not really relevant to the question, but I feel like Guile's roundhouse Flash Kick has been toned down a little bit since that build. It seemed like it could out-prioritize almost anything at the event. Or maybe that's just the initial shock of its suddenly becoming viable coloring my perception. LARRY: That's why I always get jealous of the New York and L.A. peeps. In Atlanta, we don't get Street Fighter Club events! The best thing for me has been seeing Capcom's response to our work being so positive. During the last three to four years, we've dramatically upped the quality in OC ReMixes freely available on our site and we knew the depth and breadth of talent that we have to pull from, but, as Dave mentioned, Capcom's decision to tap into our community's talent gave us much greater industry recognition than we've ever received before. Seth Killian and the Capcom Unity crew were awesome getting the news out to the fans once it went public that we were creating the soundtrack. During the open beta testing, Capcom's VP of Strategic Planning & Business Development, Christian Svensson, dubbed the soundtrack "impactful" on the Unity boards, which was great praise coming from the top of the company. Rey also put us over very strongly in his comments for the soundtrack release. When he says he's hoping to work with us in the future, we can't help but feel satisfied. It's one thing to be given a dream opportunity, it's another to take the ball and run with it the way our guys did. SFD: How many people were involved with the tunes for SSF2T HD Remix? We really secured a great representation of the OCR community, so be sure to check every one of those guys out. And like we've mentioned in promoting the soundtrack, the depth of our lineup resulted in a ton of musical styles within HD Remix. We've got electronica, big beat, hip-hop, jazz, reggaeton, garage rock, spaghetti western and more in there. If you like those, you can hit www.ocremix.org for more than 1500 other great ReMixes. I'd like to think we're sneaking in musical diversity training for everyone. [laughs] Special thanks have to go to Malcos and Jos� the Bronx Rican for carrying a huge share of the soundtrack. Everyone contributed amazing stuff that'll be part of Street Fighter forever, but those two especially delivered in a big way. SFD: Can you give any advice to fans who want to be more active in mixing video game music? DJP: Pick a tool and learn it well. Whether it's FruityLoops or Reason, piano or guitar, it doesn't matter. I think there's a tendency to diversify and/or spend too much time focusing on tools, plugins, samples, etc. at the expense of songwriting. Ultimately, the technical stuff just gets in the way of what's important - making music - and simplifying your workflow and focusing on a specific toolset can help a great deal. Since we're talking about arrangement, primarily, I think it's important to begin with a piece that inspires you, takes you in different directions, gives you musical ideas for completely new pieces. You take that inspiration and then channel it back towards the original composition, you usually end up with something solid. Different people learn differently, but for me, the most helpful musical tutor has been experience. I try to listen to a lot of different types of music, and when I listen, I try to decompose a song into its constituent elements - focus in on JUST the bassline, notice how transitions are handled, ask yourself whether the same song would work as well at a slower or faster tempo. Deconstructing and reconstructing music in your head might seem like a lot of work initially, but once you do it enough, it'll become second nature and won't get in the way of actually enjoying the song. That's the single biggest thing: learning how to listen. Once you can listen to a song and understand what's going on structurally, instrumentally, and from an audio production perspective, you start hearing music in a new way... almost like learning to appreciating different schools/techniques in painting. Then you'll sit up and say "Whoa.... I know Kung Fu," just like Keanu Reeves, only you won't go on to star in two underwhelming sequels... because you'll be too busy making kickass video game remixes. SHAEL: Scour as many music-making communities as you can, find the people in each you think sound the best and politely ask if you can pick their brains. See if you can get someone to mentor you via chat, email, phone calls, or even meatspace. Join the OverClocked ReMix ReMixing forum, and the secret OverClocked ReMix IRC chat. Practice. Try something new. Don't imitate; innovate. Though I didn't devise the format, Blood on the Asphalt was the first OCR tribute album to aim for thematic and tonal consistency, and I was the first project head to use the title project director, rather than project organizer, to better reflect my type and level of involvement. Even if you're following an old formula, you can refine it, you can add on and make it better, or at least more suited to your vision. I'm sounding a bit like a fortune cookie here, huh? Here's a big one: don't limit yourself to involvement exclusively in the video game remixing community. There is a practically limitless number of other music scenes out there, and each one can teach you something invaluable that you can generalize to application in video game remixing. Go forth and seek out new worlds! LARRY: While I don't make music myself, I listen to practically every remix submitted to us as OCR's head submissions evaluator, so I'm in the trenches critiquing and helping artists in our community every day. On top of everything Dave and Shael said, you've got to realize that you can't and won't start off making A-level material. Nonetheless, there are several artists in our community who, despite not being able to read notation or sheet music, have gone from knowing zero about making music to making awesome stuff in about 2 to 3 years. But it's a long process. The ones who persevere will have something to show for it. Beyond that, learn to take constructive criticism well and don't take it personally. Even after you've figured out how to put most of the pieces together, it'll take a while for you to make music that's truly cohesive. We've had fairly decent artists become upset at having a promising remix rejected from OCR, only to continue improving and admit a year later something like "I was mad when I got rejected, but when I listen to that mix now, they were right to reject it." That's what happens as you grow and gain perspective. Just keep at it, absorb knowledge, take criticism, and be coachable. SFD: Fans have been constantly asking where to find these tracks. Is there an album they can purchase in stores, or a website they can legally download from? LARRY: Everything we've done at OC ReMix since 1999 has been free, and djp specifically worked out with Capcom that we be allowed to release the soundtrack free. Rey and the company couldn't have been more accommodating. 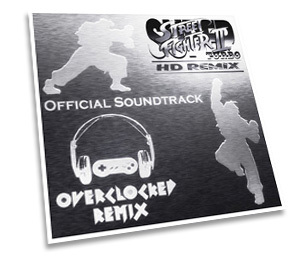 So everyone reading, if you haven't picked it up already, click HERE and you can get OC ReMix: Super Street Fighter II Turbo HD Remix Official Soundtrack for zero dollars and zero cents. We love getting our ReMixes out there for the fans to enjoy--that's what our Web site is all about--and it's been a big deal that HD Remix is the first completely fan-made soundtrack for a major game title. Releasing it free gets the work of our guys in as many ears as possible. Download the entire album FREE! OC ReMix is all about respecting and tributing the original game music while showcasing its quality through interpretation. And our industry support shows we're doing the right thing. That support wouldn't be there if the quality of our ReMixes wasn't excellent. I've also read reactions everywhere from the fans and the game reviews, and the major majority of the reception has been great. Thanks so much to all the fans who've enjoyed the HD Remix soundtrack. You guys keep following OC ReMix for more great ReMixes, and just keep spreading the word about what we're doing. We've got new stuff every few days, we'll keep putting 'em out! SFD: Thanks for spending some time with us guys. Keep in touch! DJP: Gracias... please tell your readers to go easy on anyone playing online as "djpretzel"... I think I'm ranked 20,000th on the scoreboards, now, and dropping daily! SHAEL: Thanks for having us. I like your website! I had no idea my Street Fighter II: The Animated Movie VHS was worth money. LARRY: You serious, Shael? Man, I have that on VHS too, the unrated cut. Couple of Street Fighter II V tapes too! [laughs] Same here, SFD, thanks for having us. Street Fighter Devotion is really thorough. I love all the interviews, character bios and features; they really show off just how deep Street Fighter is, from the games, to the comics, anime, art, figures and obviously the music.